We have been eagerly awaiting the time change and its resulting extra hour of sleep. 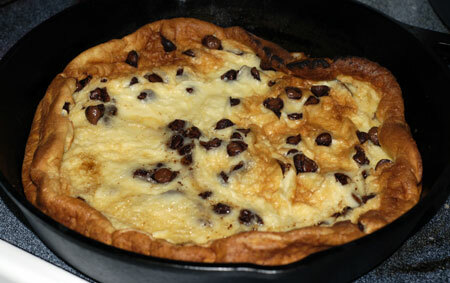 To celebrate, I used the extra time to make a chocolate-coconut dutch baby for breakfast. I had some coconut milk leftover from the bostini cream pies, so I decided to take a risk and use that in place of regular milk (selfishly, I admit, so I’d have some of the latter available to drink). The coconut milk worked out beautifully, and I topped the finished wedges with a bit of toasted coconut to further highlight the flavor. Preheat oven to 450°. Place a 10-inch cast-iron skillet in a 450° oven for 15 minutes. Combine first 5 ingredients, stirring with a whisk until smooth. Melt 1 tablespoon butter in preheated pan until browned, swirling to evenly coat pan. Add batter; sprinkle evenly with chocolate chips. Bake at 450° for 10 minutes or until puffed and browned. 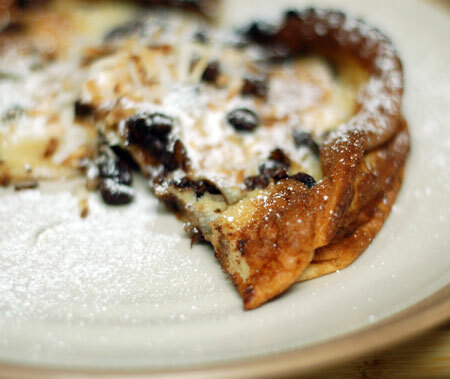 Serve slices of Dutch baby with a dusting of confectioners’ sugar and toasted coconut. You could also serve this with some fresh fruit or sauteed bananas. Update 11/16/07: Aaah, that’s a better picture! Different recipe, equally yummy result. 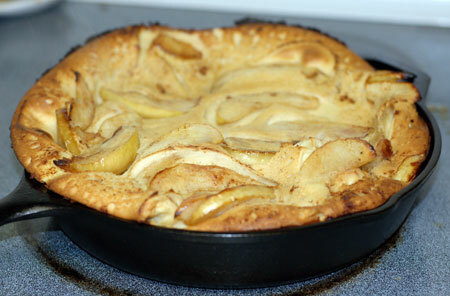 This was the Big Apple Pancake, made with a Jonagold apple, some cinnamon and nutmeg, and white whole wheat flour.